The summer heat has kicked in, which means it’s time for summer cocktails and lighter libations. 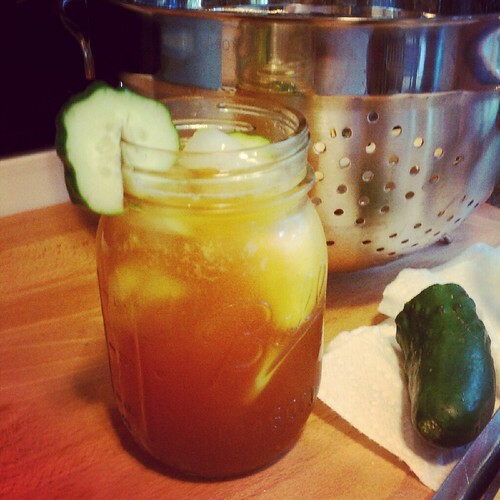 Lately I’ve been all about Pimm’s Cups, a tasty summery drink from across the pond made with Pimm’s #1 – an herbal spirit that balances the notes of the citrus, cucumber, gin, and ginger ale mixed in it. I think it’s the perfect use for those cool, crispy cucumbers from the farmer’s market (or a generous neighbor!). It’s also a natural fit for the small batch gin heyday we’re having right now. When I was in New Orleans this past March, even the diviest of bars had the fresh ingredients on hand to make that perfect cocktail (oh NOLA, how you are missed). Like most cocktails, there are a variety of ways you can make it. I think the most traditional one includes muddled cucumber and Beefeater’s Gin, and bitter lemon or ginger beer. I love a little extra cucumber, Hendrick’s Gin, and Seagram’s ginger ale. I love to add strawberry and mint to my pimm’s! You are currently reading Another day, another Pimm’s Cup at mingaling.